“Koss” never achieved mainstream acclaim like fellow British bluesmen Eric Clapton, Peter Green or Alvin Lee, but he was arguably equally as talented. The tragic reason Kossoff is often forgotten is that he died so awfully young – at just 25, after a prolonged battle with medication abuse. Kossoff was always destined to be a guitar star, no matter how briefly. Performing was in his family genes – his father was the noted British actor David Kossoff – and he took classic guitar lessons for six years up until his early teens, but had pretty much stopped playing until he saw Eric Clapton play with John Mayall’s Bluesbreakers at The Refectory in north London. His first ‘real’ one was a ’54 Gibson Les Paul Custom, and he immersed himself in learning to play the electric blues. Around the same time, Koss had a Saturday job working in Selmer’s music shop in London’s West End. One day, he was asked to assist a wiry American who was visiting the shop with his manager, Chas Chandler. “He had an odd look about him and smelled strange,” Kossoff recalled. The guitarist asked for a left-handed guitar, but Selmer’s had none. So the American buyer, one Jimi Hendrix, simply flipped over a right-handed model and played. “He started playing some chord stuff like in “Little Wing,” Kossoff said, “and the salesman looked at him and couldn’t believe it. Noted British blues producer Mike Vernon was just as impressed: he soon had Black Cat Bones involved in his blues promotions in Britain. Black Cat Bones played support for the fledgling Fleetwood Mac, plus they were recruited to be backing band for Eddie Floyd and Champion Jack Dupree on London shows. Kossoff never recorded ‘properly’ with Black Cat Bones. But original drummer Frank Perry has kindly posted a raw rehearsal on YouTube, with the 17-year-old Paul Kossoff wailing away. Kossoff and Bones’ later drummer Simon Kirke soon decided the 12-bar band had reached its limit. They left to try and form another band, and had soon recruited a singer called Paul Rodgers: the deal was sealed after they jammed on T-Bone Walker’s “Stormy Monday” and Memphis Slim’s “Everyday I Have the Blues.” When they added bassist Andy Fraser – who had played with the Blues Breakers aged just 15 – Free were born. To some, Free are just known for the international hit “All Right Now.” But they had much more to their music: “The Hunter”, “Wishing Well,” “Fire And Water”, “Heavy Load,” “Mr. Big”, “The Stealer” and many others added a soulful and funkier edge to the music that emerged from the British blues boom. If it were not for Free’s best songs would, for example, The Black Crowes ever had existed? For much of Free’s glory days, Koss used his ’59 flametop Les Paul Standard through a Marshall head with a cabinet that he and his father, impressively, built themselves. All four Free men were talented, but Kossoff truly found his guitar voice in Free. Even at age 18-19, he played with an aggressive attack, utilizing heavy picks and heavy strings for maximum tone, and developed a unique vibrato. It was sometimes slow, but mostly wide, trilling and quick. He was still learning, and immersed in technique to make him sound how he wanted. Besides his main sunburst Les Paul, Koss also played his 3-pickup black mid-50’s Les Paul Custom through Marshall and Laney amps and other Les Paul Standards. Free’s sound did change. Their 1968 debut album, Tons of Sobs, was recorded in just one week, essentially live. By second album, Free, they were a little more mellow. They could even write pop hits, with the likes of “My Brother Jake” following. But all inevitably featured outstanding guitar playing from Paul Kossoff. Even when successful with Free, Kossoff was a restless soul. He put himself forward for audition for both The Rolling Stones and Jethro Tull in mid-1969 - Mick Taylor and Martin Barre eventually got the gigs. 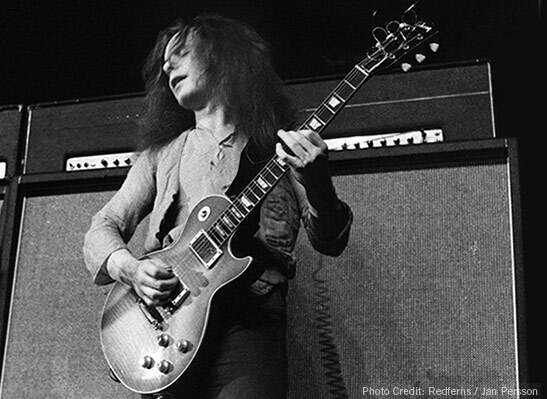 When Free were on tour with Blind Faith in the U.S, Eric Clapton was impressed by Kossoff and swapped yet another ‘burst Standard for Koss’s early black Les Paul Custom. Koss also picked up several more Les Pauls, including two late-‘50s PAF-equipped models, with the sunburst finishes sanded off to give a blonde appearance. But after just four years, Free split. Fraser and Rodgers reportedly wanted to branch out into more diverse material, but Kirke and Kossoff wanted to stick to hard-driving blues. The posthumous Free Live! album arguably captures the band at their best. Free briefly reunited for the Free at Last album, but eventually everyone went their own way again. Rodgers and Kirke famously formed Bad Company, Koss went onto to record Back Street Crawler. Though a solid release, Koss had by then largely abandoned his Les Pauls, forever in search of a new sound. In between, Free recorded the Heartbreaker album, but the ailing Kossoff didn’t feature heavily. And by 1976, Paul Kossoff was dead at just 25 years of age. Free weren’t an experimental band – “our strength lies in our simplicity,” the 20-year-old Kossoff said in 1970 – but they were blessed with four great musicians. Guitar, bass, drums, vocals. And partly because of Paul Kossoff’s guitar playing, that simplicity was sometimes pretty special. And here’s Free’s “All Right Now” live, with Kossoff’s finger vibrato in full effect.